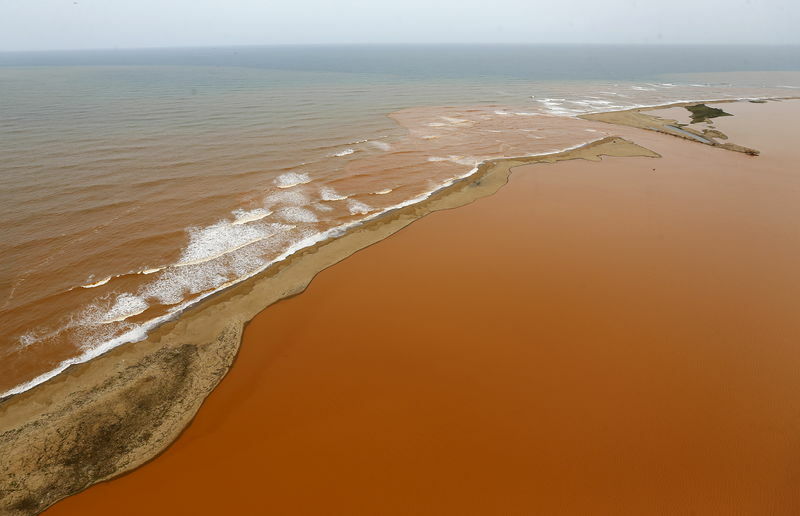 The toxic result of the massive spill entering the Atlantic ocean, 800 kms along the Sweet River from the collapsed tailings dam at the Samarco iron mine. • The worst in size: 60 million cubic meters of metals-laden muck spilled. • The worst in how far it spread: a toxic tsunami from the mine site in Mariana over the 800 km of the now dead Sweet River to the Atlantic Ocean. • The worst in the cost of reparation: compensation for loss of lives, property and livelihoods and reconstruction after massive environmental damages throughout the Sweet River Basin, home to 3.2 million people. Nineteen people lost their lives. Five nearby communities were buried in muck, leaving more than 1200 people homeless. Communities hundreds of kilometers away lost farmlands, water supply, fishing grounds, crops and livestock. 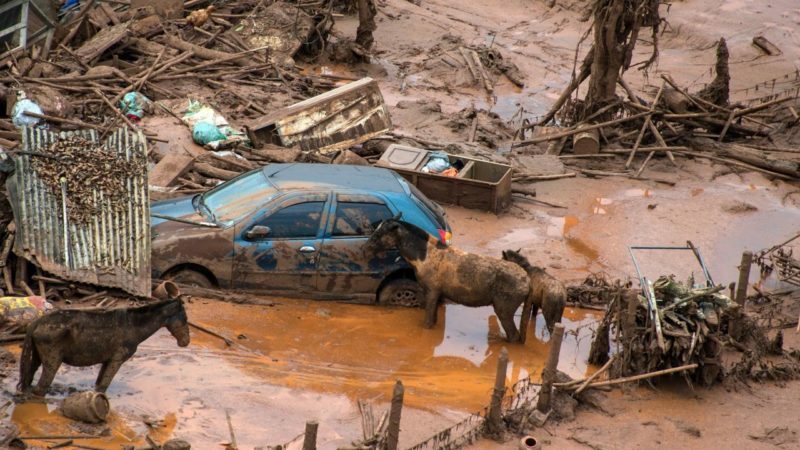 The aftermath of the Samarco mine dam collapse in Bento Rodrigues, Brazil. After a six month investigation, Brazilian Federal Prosecutors filed a 359-page civil lawsuit. The US$58 billion lawsuit names Samarco and its joint owners, Vale and BHP-Billiton. It also names Brazil’s Federal government and the state governments in Minas Gerais and Espirito Santo, accusing them of regulatory negligence in issuing environmental permits and failing to monitor mining operations. Samarco produces pellets from processing low-grade iron deposits into a high value-added product, marketed to the global steel industry. Founded in 1977, Samarco’s integrated system in the states of Minas Gerais and Espirito Santo now encompasses two mines, three processing plants, three mineral pipelines, four pellet plants and a port. The Mariana complex also includes 3 mines and 4 processing plants wholly owned by Vale. Extraction and initial processing produce dry waste, stored in waste dumps, and wet waste, stored in tailings dams. Samarco and Vale store wet waste in three large tailings dams, Germano, Santarem and Fundao. All are Class III dams with high potential for environmental damage according to state classifications. Samarco’s fourth pellet plant, launched in 2014, increased production by 37%; waste dumped in the tailings dams also increased exponentially. What were the circumstances surrounding the Fundao dam’s collapse? First the market context. After the super cycle of commodity prices from 2002-2012, iron prices had plummeted from $200/metric tonne in 2008 to $38 in 2015. In 2009, Samarco had commissioned a 24 hour monitoring plan of its dams, as well as an Emergency Action Plan. With the economic context worsening, Samarco intensified production and cut costs by laying off workers, postponing maintenance and minimising security. 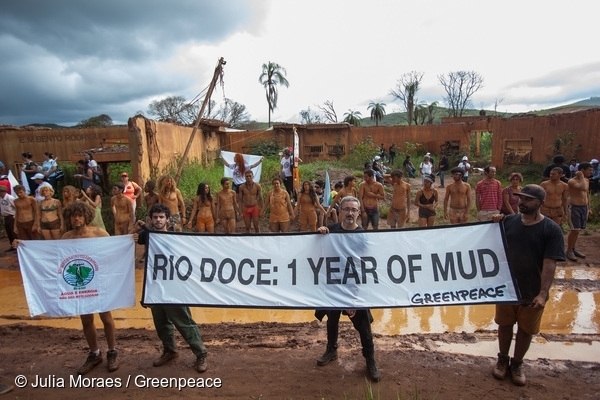 Samarco never implemented the monitoring or the emergency drills in adjacent communities. Second, the regulatory context. Brazilian mining companies operate in the same milieu of “regulatory capture” as South Africa or Canada. Mining companies in Brazil had successfully lobbied for “self-regulation”, persuading government to reduce environmental licensing and monitoring requirements. But they continued pressuring for even more deregulation. One month before the disaster, Governor Fernando Pimental, (Workers Party, PT), was preparing a bill for further relaxation of licensing procedures. Third, prior warnings that the tailings dam was structurally weak went unheeded. Fundao dam had been fasttracked to take advantage of the boom. It was modified twice between 2008 and 2015, with a rapid review process, dispensing with required public hearings. An engineer involved in constructing the original dam claimed he had alerted Samarco of the risk of rupture in 2014. Fourth, both Samarco and Vale were major contributors to the political party in power in Minas Gerais. Beatriz Cerqueira, president of the CUT labour central in Minas Gerais, called for a Commission of Inquiry into the strategic role mining companies are playing in financing electoral campaigns. “The main candidates for the Presidency of the Republic, … for governor of Minas and a large number of the candidates for state deputies, federal deputies… are financed by the mining companies. Many studies in the universities are also financed by the mining companies. In addition, there are the major PR campaigns carried out in the media, compromising journalistic coverage of the companies. Brazilian social movements, unions, NGOs and churches rapidly joined forces. They accompanied those directly affected by the catastrophe to lobby for more adequate responses from government and mining companies. MAB, the Movement of People Affected by Dams, deployed activists from other parts of Brazil to reinforce their organising activities with affected communities all along the Sweet River. University-based researchers wrote investigative reports that provided technical support to reinforce community proposals. The over-arching demand was that those directly affected be treated not as victims but as citizens, placed in harm’s way by private companies licensed by their government. Those affected are demanding government defence of their rights and full participation in all deliberations about emergency measures, resettlement and compensation. Landless Peoples Movement leader, Joao Pedro Stedile, sharply questions the state’s absence. Protests notwithstanding, the main vehicle today for responding to the massive rights violations is the private foundation set up and funded by Samarco, Vale and BHP-Billiton. The perpetrators of the crime still get to decide who is to be compensated and how much is to be paid. Critics fear the new foundation will further cripple the already inadequate state role. I joined 400 Brazilians and international activists to commemorate the 1st anniversary. Five busloads did a “reverse march” over three days, starting in Regencia, the now abandoned beach resort where the toxic tsunami entered the Atlantic Ocean. We then moved westward along the 800 km Sweet River basin towards the mine site, with commemorative events and public hearings and tree plantings in affected communities along the way. We arrived in Mariana for two days of testimonials and cultural events in a massive stadium. The cement bleachers served as camping grounds. Photos of the 19 fatalities marked the entrance. On the floor was a five meter long model of the destroyed river basin, complete with polluted water, dead fish, ruined crops, destroyed houses and people fleeing. In nearby cities, an international meeting of BHP-Billiton workers was taking place and a university working group was holding a one year review of Mariana and its aftermath. On November 5, about 1000 people gathered in Bento Rodrigues, the community closest to the collapsed dam. Only the odd wall and ruins of a school remain. Semi-clad figures carrying crosses and plastered with mud re-enacted the chaos when the dam broke – screams of terror, phone and text warnings to flee and heroic acts to rescue children and neighbours. Church and community leaders spoke. The event culminated in a simple mass. Were these circumstances surrounding the tailings dam collapse unique to Mariana? Or are we just describing the operational mode and attendant risks of many mines in the post-boom era, whether in North or South? Has the prevailing neoliberal context become the new norm? A context of corporate impunity, of company/government connivance and systematic disregard for the safety of workers, adjacent communities and the earth itself, our common home. dams? Are mine sites best understood as disastrous, toxic spills waiting to happen? Today, corporations like Vale, Rio Tinto, Anglo American and BHPBilliton enjoy full government support. Governments, North and South, treat the interests of the mining company as if they were tantamount to the public interest. As Marikana made clear, and Mariana confirms, governments place less value on defending their own citizens than on maintaining investor confidence. With governments as handmaidens of private mining companies, social movements and public institutional voices from churches and universities need to intensify efforts to end corporate impunity. We need to defend not only the workers and communities affected by mining, but also the land and watersheds and ecological systems that extractivism destroys. Judith Marshall is a Canadian popular educator and writer. She has recently retired after two decades in the Global Affairs department of the United Steelworkers and is now attached to York University.